Now that Apple Music is out, and people are seeing how well the curation works, I’ve seen people ask about curation in the App Store. Go look at the App Store. What do you see? Almost all of the iTunes front page is curated content. Big banners at the top for hand-chosen featured apps. 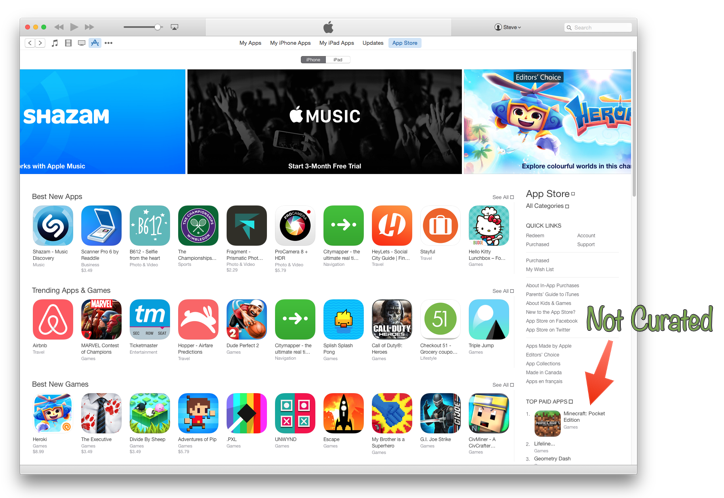 “Best New Apps”, again hand-picked. “Best New Games”. “Trending Apps & Games” (which I believe is also hand-picked, although likely hand-picked from the actual trend data). Then there’s a collection of curated lists of apps. “Disney Bundles”. “Editor’s Choice”. “App of the Week”. “Essentials”. “Great Free Apps”. “Backyard BBQ” (apps for planning, cooking, and fun at your BBQ). This is curation, and the App Store is doing a great job of it. Personalized recommendations is a different ball game. Apple Music algorithmically chooses curated playlists to recommend to you; it’s a mix of curation and data mining. The App Store doesn’t seem to do any of the latter – it doesn’t use what it knows about you to suggest apps to you. This entry was posted on Wednesday, July 8th, 2015 at 7:18 am.